They are rabidly using this phrase "Boston Strong" since the little drama. Today I saw that it is on the front of all the buses. I'm sure this cute slogan was selected for use prior to the staging of this event. It makes me think we will be seeing more such sayings used to further solidify their hold on the non-critical thinking masses. The ironic thing is Boston is showing anything but strength. It takes strength to question authority and the official story. It takes strength to wade through the evidence and debunk it. It does not take strength to hate the brothers and swallow the official story, garbled as it is, without any consideration. What is it we're looking for in the Arrendondo GIF posted at the top of this page? Obviously the background is green screen (how do all those people walk by oblivious to the presence of the TV cameras and a "hero" without ever looking over?) - is that the evidence we're showing to doubters? I hope I'm not missing something obvious because I know most people I would show that to would see nothing wrong with it. It's much more than that. If you look at the buildings in the background (particularly noticeable at the "Sweet" sign and below it), you will see that the buildings "warp" in an unnatural way. In fact, the warping is physically impossible in real life and indicative of a greenscreen that is moving in the background. It's quite absurd once you see it. Yes, our rights and freedoms are certainly being pawned (held hostage) to pay for our own enslavement. And, as Simon rightly called symbolicism (ref page 4 viewtopic.php?p=2382895#p2382895), the deliberate inclusion of every possible visual, visceral, aural and semantic association for maximum emotional, conceptual impact is what makes these Psychological Operations so "successful" in achieving their intended affects on the majority (with planted bait/"candy" for every known prejudice and doubt). Blowing minds, flags (nations) and complacency — devised to blow innocent naïveté (like balloons) in whatever direction they want. 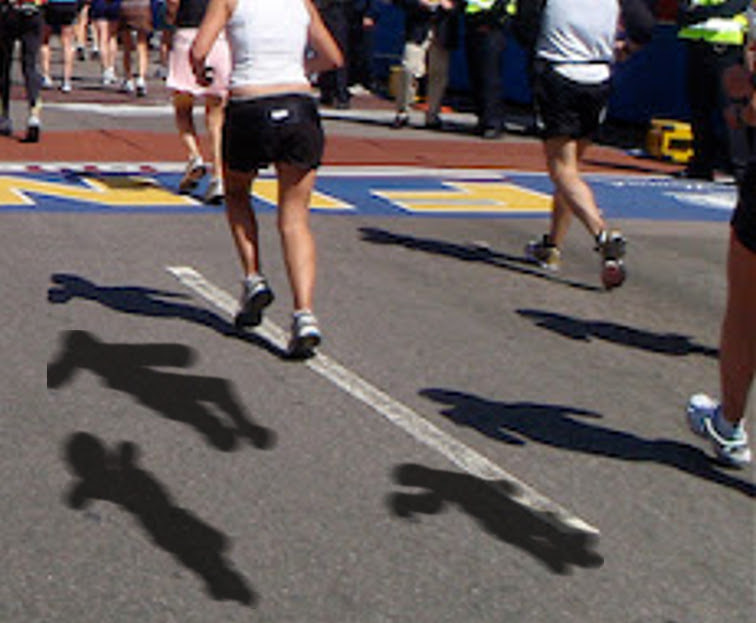 ♪ "The answer my friend is blowin' in the wind..."
MrSinclair wrote: They are rabidly using this phrase "Boston Strong" since the little drama. Today I saw that it is on the front of all the buses. I'm sure this cute slogan was selected for use prior to the staging of this event. It makes me think we will be seeing more such sayings used to further solidify their hold on the non-critical thinking masses. The ironic thing is Boston is showing anything but strength. It takes strength to question authority and the official story. It takes strength to wade through the evidence and debunk it. It does not take strength to hate the brothers and swallow the official story, garbled as it is, without any consideration. And wouldn't you know it, Balloon Lady arrives with her special delivery of symbolism, just steps ahead of the Terror Brothers! My guess is that each balloon represents each of the three "lost souls" of the event. After the bomb blast, the balloons are seen drifting up to heaven, fortunate to escape shrapnel and poppage by shock wave. In other words, 'Ace B' suggests that the TV networks were somehow duped by some external entity inserting planes into their legit TV feeds - hey, maybe by Binladen with his powerful satellite-transmitter from his hi-tech Afghan cave? But here's the thing, regarding these latest 'minor' psyops (Boston /Sandy Hook / Aurora / Tucson and so forth): these actors we see may well exist in real life - but they may ultimately just be 'pixel layers', i.e. characters pre-filmed in some studio and inserted - as needed - into full-blown digital surroundings and sceneries. Besides there being tons of absolute proof of non-plane fakery on 9-11, Ace Baker's pushing of the whole concept of co-ordinating things like some 'Misson Impossible' operation where everything has to be done at the exact moment, things have to be co-ordinated by the split second, fake planes overlayed on 'real live shots of buildings' and co-ordinating it exactly with the explosions in the buildings is completely unnecessary and absurd when you think about it. It all plays into the 'government' has to work really hard to fool us smart people and our lovely watchdogs in the media. Why even bother with all that ? Why take the chance that you might screw it up in that 7 second window or whatever ridiculously short period of time you have to pull it off 'live.' Why go through all that trouble when you can take your sweet time, make a movie months ahead of time, chop it up in pieces and then just run it as 'live.' Of course, as Tim Abirato has also noted on his radio show, the easy possiblity of THAT VERY SCREW UP, the nose out shot, might have been put there ahead of time for No-Planers to chase and for Ace Baker aka Collin to later come on the scene as their 'guru' and offer the explanation, therefore gatekeeping the whole thing into 'just the planes were fake.' It didn't work but for a couple of years he did have people confused as to which theory was correct, only-planes-were-fake or 'total CGI.' Of course, 'total CGI' was another false representation of the Clues Forum position, since you guys have never claimed 'Total CGI,' just much more fakery of all kinds, in combination, than most others have been led by the nose to assume. Similar thing with Boston Psy-Op. That EMT guy who posted that analysis on the bodybuilding forum is trying to say that they're attaching prosthetics to the legless guy 'live,' right there on camera and the black woman is there to block this from view. Who did they attach the prosthetic to ? An already amputated guy ? Didn't anyone see an amputated guy wandering around this area ? This is almost certainly nonsense. Nonhocapito was on it right away. The EMT guy is giving you good information only to confuse the issue by steering it towards 'it was done live with actors.' It wasn't done 'live,' it was prepared ahead of time with actors, CGI, special effects, photoshop, etc. to look live. They make all the images and videos and control the entire image pool. Then through complete control of the media which they have demonstrated going back to the hoaxed moon-landings and the dumbed-down state of most people in general, they just pretend all of it was shot live on the scene. Part of the news media, the main anchors and the higher-up people have to be in on it, the others are compartmentalized and just go along with it. Any rogue people are then prevented by FBI and cops from investigating the whole thing further. If they keep causing trouble, they fire them or never give them any air time and that's it. The "B-Team" was hired for this job. Shadows are ink-tooled on. Ink tool, opacity, motion blur. 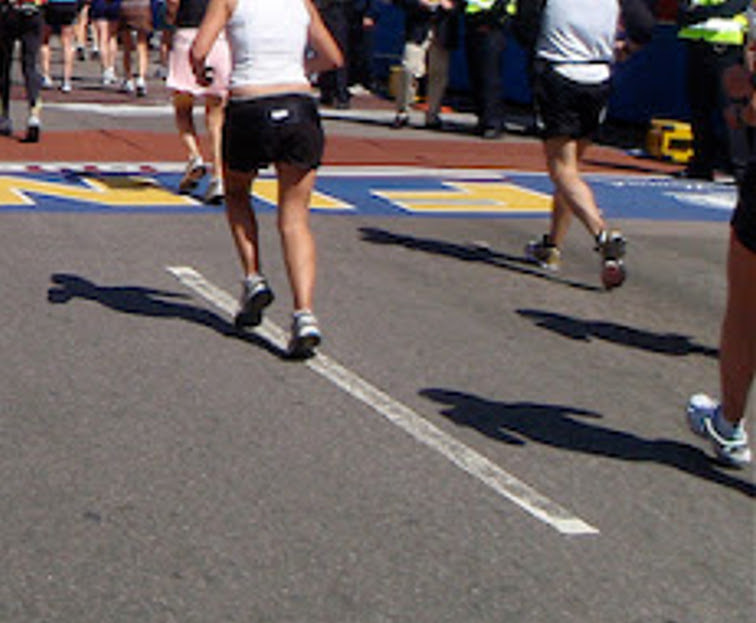 That picture is from the 2012 marathon. Do you think they faked that one too? Which do you mean, the "photographs" or the event? That was a truly excellent post. Thanks. And thanks to all - old and new members alike - for steadily improving the depth and quality of your contributions to this forum. Keep it up! Absolutely not, mon cher Fedge - I thank you for re-posting it. 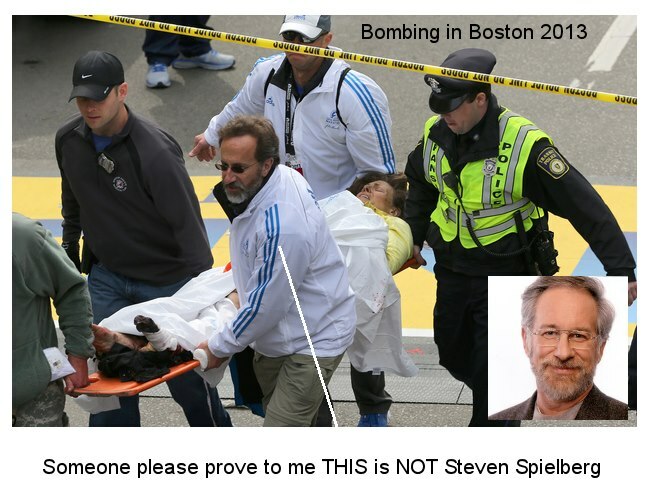 Here's my point: even if this little (botched) 'interview with Arredondo' might seem like a petty little detail in the overall "Boston bombing" image-pool, it goes to show how it might have ALL been crafted. What if - yes - what if every single video we have of that day was crafted in the same way? Would that be so difficult to conceptualize? MOST people are still unaware of what can be done with computer-graphic technology - and I even include myself in that lot, as I do not have the tools to craft such imagery in any convincing manner. Therefore, I can easily imagine how hard it is for people who have zero experience in this domain to even consider it. And the military usually have a 10 year jump on people with technology it shutters to think what kind of digital fakery they will have in another 10 years. Pretty soon you will have to question whether you are actually watching "real" people on the tele if you arnt already now. Not a joke, a wrong track to be picked up by the "all actors" dudes. That's rather a stretch of the imagination isn't it? Steven Spielberg is a man, the above thing which you point at is a cloud of pixels.